Peppermint and chocolate is one of my all-time flavor combinations, and this hot treat with white hot chocolate, chocolate whipped cream, and minty Altoids is a perfect dessert drink for a cold day. 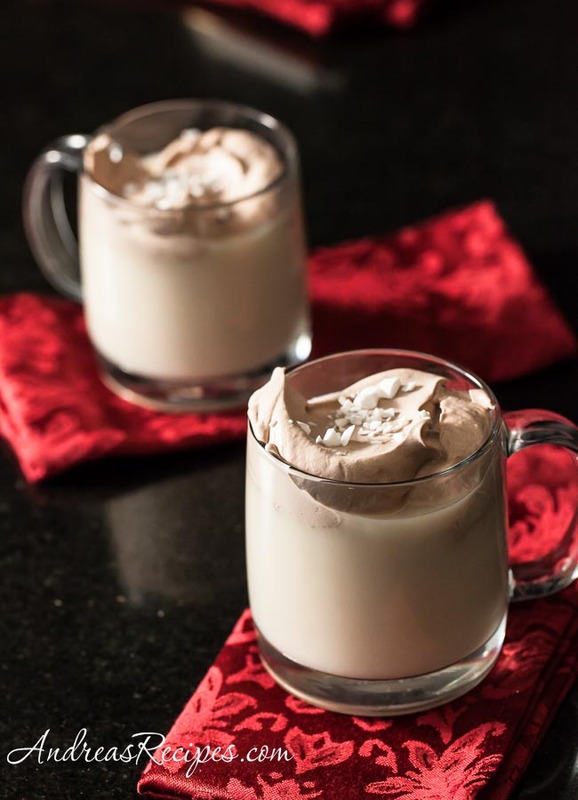 A twist on the classic Hot Peppermint Patty drink, this white hot chocolate cocktail is spiked with brandy, white crème de menthe, and dark rum, making a mug of cheer sure to warm you all over. 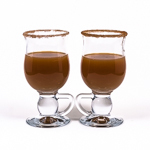 Make sure you prepare the chocolate whipped cream ahead so it’s ready to dollop on top of the mugs. If you prefer to skip the alcohol, you can melt minty Altoids in the white hot chocolate instead. Adapted from Food & Wine Cocktails ‘09. Chocolate whipped cream recipe adapted from The Cake Bible, by Rose Levy Berenbaum. WHIPPED CREAM: In the mixing bowl stir to combine the whipping cream, vanilla extract, sugar, and cocoa powder. Cover and place the mixing bowl and the wire whisk in the refrigerator for at least 1 hour to give the chocolate time to dissolve. Remove and beat with chilled wire whisk at least 2 minutes, until you have stiff peaks. 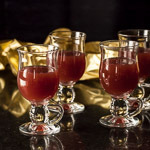 COCKTAIL: Stir together the prepared hot chocolate, brandy, crème de menthe, and dark rum in the heatproof mug. Top with dollops of chocolate whipped cream and crushed Peppermint Altoids. For a nonalcoholic version, you can omit the alcohol and melt some Peppermint Altoids with the white hot chocolate. The chocolate whipped cream recipe makes enough for 2 or more servings.